This weekend marks director Steven Spielberg’s first film in three years and potentially the last under the DreamWorks banner he founded more than 20 years ago. 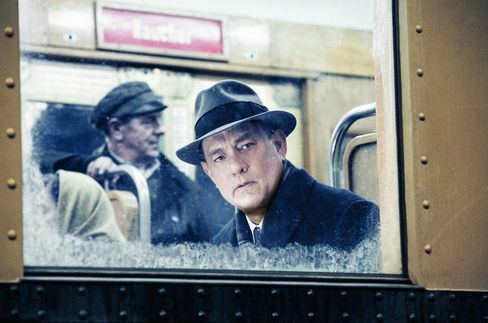 “Bridge of Spies,” a Cold War thriller starring Tom Hanks, opens in theaters in the U.S. and Canada this weekend, with critics applauding the picture and deeming it Oscar-worthy. It’s co-produced with Participant Media, a maker of socially conscious films that looks set to play a crucial supporting role in Spielberg’s future moviemaking. Participant, which specializes in topical or controversial message films, is in talks to provide about half of the estimated $400 million that Spielberg is looking to raise, the people said. A deal could involve Skoll’s company investing in DreamWorks or both merging into a new company, one of the people said. Under one possible plan, DreamWorks could be replaced by a new company, Skoll told the New York Times in September. As part of those negotiations, the distribution and marketing of DreamWorks movies may move from Walt Disney Co. to Comcast Corp.’s Universal Pictures, which originally backed the young Spielberg decades ago when he made the blockbuster “Jaws” and “E.T.” and where he still keeps his office. Participant Media has co-produced seven films with DreamWorks. Their record of collaboration suggests they’d continue to make films that are topical and historical, frequently acclaimed by critics, and often in the hunt for Academy Awards. “Bridge of Spies” is inspired by real-life events, and was written by Matt Charman and Oscar winners Joel Coen and Ethan Coen. Hanks stars as a lawyer recruited by the CIA to negotiate a Cold War prisoner exchange with the Soviet Union: downed American pilot Francis Gary Powers for KGB intelligence officer Rudolf Abel, who was arrested for espionage in the U.S. The events have spawned several books, including a historical account of the same name by Giles Whittell. The film cost about $40 million to produce, according to Box Office Mojo, as well as millions to market. 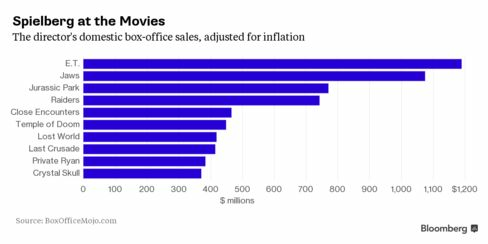 BoxOffice.com estimates “Bridge of Spies” will produce $17.5 million in weekend ticket sales in the U.S. and $64 million through its entire domestic theatrical run. Oscar buzz could extend that run and help the film in overseas markets. The film took in $500,000 in cinemas Thursday night, according to Disney, its distributor. That compares with $600,000 in first-night sales for “Captain Phillips,” the 2013 Oscar-nominated film featuring Hanks as a real-life captain of a cargo ship that’s hijacked, according to the studio. Over the near term, both Participant, based in Beverly Hills, California, and Spielberg have busy schedules. In 2016, Participant is releasing seven films, including “Deepwater Horizon,” a film about the 2010 Gulf of Mexico oil spill, with Lions Gate Entertainment Corp.
Spielberg, 68, is already at work producing another “Jurassic Park” film after the success of this year’s “Jurassic World,” which he made for Universal, and has suggested there may be a fifth “Indiana Jones” movie, this time with Disney. He directed “The BFG,” a family film based on the work of Roald Dahl, which comes out in July, and is set to direct the video-game sci-fi “Ready Player One” for Warner Bros. for release in 2017.